So we all had a feeling that garlic was good for us, but apparently, fresh garlic helps rats stay heart-healthy more than dried out garlic that's lost some of its compounds to the air. I always knew that garlic salt and garlic powder couldn't hold a candle to the real stuff, freshly chopped. Now I wonder whether these crazy things have the same nutritional value as the awesomely fragrant, huge juicy cloves I've been chopping in my kitchen lately. 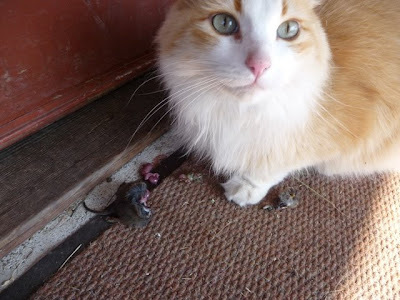 Photo of our barn-cat Google and little decapitated rodent, courtesy of Lucy. This little fellow didn't even have a chance. These days, when I'm not growing, cooking, eating, or writing about food, I'm generally reading what others have to say about (yes, you guessed it) FOOD. For more on what I'm reading lately, check out articles here and books here. <3 Google. Such a nice, fluffy cat. Yes, a lovely cat and a great hunter. It's so strange that he's got such a different personality from his brother, but I guess that's how those sibling-type things go!